Wed, 13/05/2015 - 10:39 Elise D.
As mentioned in a previous article, the NAO Challenge has been going on since September for more than 1300 students across Europe. The German final will be held on thursday 21th in Bochum. For the occasion, we interviewed the IV40 team participating to the contest. Discover what they have been up to the last past months. 1. Your team: What should we know about it? The specificities, members’ profiles, backgrounds and strengths? [Vivian Reinecke] Our team consists of students including all grades, from the 8th up to the 12th grade. All participants are students at the Städt, Mädchengymnasiums in Essen-Borbeck. [Jenny Krieger] It is important to mention that numerous students were occupied with the exams for their A-levels during the competition. [Rebecca Kiss] We already worked with other robots before but not with NAO. Several students already participated with Lego Mindstorms robots at the RoboCup. [Deborah Lemm] Our level of programming differs significantly due to the fact that some of us have already been working with robots for several years and others just started to discover the world of robotics. 2. You do not have a NAO and you have chosen the Nao Challenge amongst dozens of other competitions: Why? How do you manage to prepare the challenge? Did you get any external help? Sponsor? 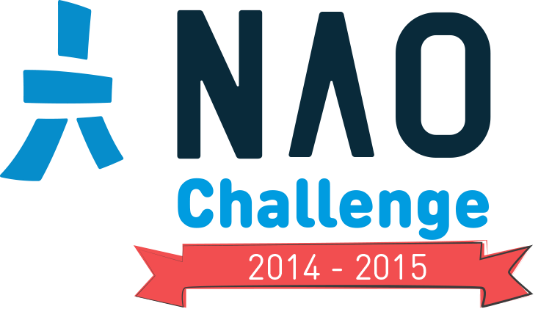 [Deborah Lemm] We registered for the NAO Challenge after having visited a student event organised by VDE in Essen. They proposed us to join the competition. We were able to borrow a NAO from the Hochschule Bochum with whom we got in contact with when visiting a “NAO Roadshow” in Bochum. In addition IKEA Essen provided us with the necessary material for the fourth test. 3. Any fun facts you would like to share? [Deborah Lemm] At the beginning we were not aware of the fact that we have to switch off the Fall Detective Manager and NAO sometimes moved all of a sudden and hit us which was quite funny as this little robot would never be able hurt anyone. 4. Had the NAO Challenge any great impacts on your students, your school, your lessons, your vision of robotics, or anything else? [Deborah Lemm] We presented NAO during our informatics course and everyone was like „Oh my god, he’s so cute!“ But then Leonie and me decided to include a dialogue where NAO said „ I hate it when people call me cute!” as NAO is a lot more than just cute. [Marie Keichel] In addition we were able to motivate other students for the field of robotics and for sure NAO was one of the reasons for their enthusiasm. [Mrs. Dr. Wolf] We are planning to introduce workshops with NAO at our school in collaboration with the Hochschule Bochum. During these workshops our female students will get the chance to take their first steps in programming NAO and to get an insight into robotics in order to arouse their interest and curiosity into the STEM subjects. [Vivian Reinecke] We separated our team into smaller groups and each group was responsible for one test and in order to solve it we met frequently in our little groups. [Rebecca Kiss] Due to significantly differing time schedules often we could not meet as a whole group, but nevertheless we communicated on a frequent basis in order to exchange our experiences and achievements. [Deborah Lemm] The fourth test was the most challenging one. Here we had a lot of problems starting again with the fact that the Fall Detective Manager was not switched off and consequently NAO fell whenever he could not stand completely stable. Moreover we had to solve the problem of how to get NAO into the cart. [Jenny Krieger] Afterwards when we wanted to program the second NAO to push the cart, the problem was that we did not know about the ultrasonic sensors in the new version being turned on and hence NAO did not move whenever recognizing an object in front of him. [Deborah Lemm] Unfortunately we did not notice this difference right in the beginning but only after 10 hours of work and study. [Rebecca Kiss] During the challenge “Movie Time” we had some difficulties with the connection to the server and to the database. 7. Robotics at home: How do you see it in the future? [Mrs. Dr. Wolf] I would love to have a vacuum cleaning robot. [Marie Keichel] I believe robotics will play an important role in our lives in future. [Vivian Reinecke] Vacuum cleaning and grass cutting robots do already exist and function quite well. [Deborah Lemm] In Japan they are currently testing a home robot supporting housework, the future is already there. [Jenny Krieger] Taking the RoboCup and its league „Robot at home“ into account, one can already notice that robots are getting more and more intelligent. In addition the face recognition is improving significantly. [Deborah Lemm] We believe that robots will be soon introduced into our homes. But are we scared or sad about that fact? No, why? Personally I would just be scared of a robot more intelligent than me. [Jenny Krieger] AI is great! [Deborah Lemm] AI is great, but only up to a certain extend. [Marie Keichel] Robots might be helpful at home to a certain extend, in order to support domestic work, but not to take over our homes. 8. Nowadays in Europe, there are much more male-engineers as female-engineers. As ladies, what does interest you in robotics & Nao? Do you think that Nao does motivate people to choose scientific careers? [Whole team] Why are girls interested in robotics? For the same reason as boys! [Deborah Lemm] Yes, I am planning to start a career in the area of robotics. [Vivian Reinecke] I am convinced that NAO can motivated pupils and students to choose a career in natural sciences. Every robot that is able to inspire students, automatically arouses their interest into informatics and science. 9. There are about 200 teams across 5 countries: what do you want to tell them? [Rebecca Kiss] I like the teams from other countries and I love the fact that thanks to the NAO Challenge we connect with students from all over Europe. [Jenny Krieger] We would like to tell the other teams that we are happy to compete against them. May the best be the winner and more importantly may we all have lots of fun during the NAO Challenge. [Rebecca Kiss] We would like to socialize internationally.